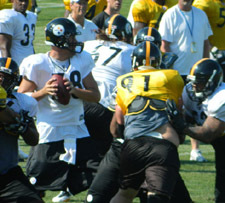 For practice Sunday, Pittsburgh Steelers QB Ben Roethlisberger wore an oversized jersey No. 78 in tribute for former Steelers OT Max Starks. Starks played for the Steelers at 6-8, 345 pounds. “It’s his practice jersey. It’s little big. 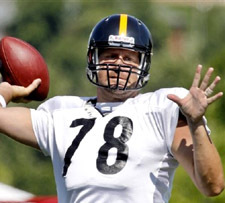 It kept riding on my neck,” said Roethlisberger. “First and foremost, he was a very good friend,” said Roethlisberger. “Like I said, our lockers were next to each other. So we spent a lot of time together, everything from hearing him snore (during naps) to us complaining about things to just all the things we’ve gone through. You can read more from Mr. Mihoces here. You can see photos from this weekend here. Quarterback Ben Roethlisberger fired a wide-receiver screen to split out Mike Wallace on the opening play in 11-on-11 drills that quickly broke open for a long gain. Roethlisberger followed that with a short across the middle that tight end Heath Miller pulled in among several nearby defenders for a first down. Roethlisberger, who wore a No. 78 practice jersey to honor former Steelers left offensive tackle Max Starks, continued to be sharp in moving the ball down the field…. You can read more from Mr. Grdnic here. You can see a few fan photos from today here. If you would like to share your photos from training camp, please email me ([email protected])! “Kindle made it through the three-hour practice in full pads without incident, which is very good news for all concerned. He was a premier pass rusher in college and would be a major asset to a Ravens team that had a franchise-low 27 sacks in 2010. There’s a long way to go before he gets the chance to strike fear into Ben Roethlisberger in the regular season opener at M&T Bank Stadium, but Saturday was a good day.’ — Peter Schmuck at The Baltimore Sun, on the Ravens’ Sergio Kindle.